136 years ago on this very day, our church officially began-on June 1, 1878. That is a long time ago! Much has changed in that time. Anybody know who was president in 1878? [ASK] Rutherford B. Hayes. I had to look it up. Big, huge bonus points for this: who was Oregon’s governor in 1878? [ASK] A man named Stephen F. Chadwick. He was the first to become governor without being elected-he was secretary of state when the governor he served under was appointed to the US Senate, and Chadwick was the next in line of succession. It was the gilded age, the time of industrial revolution. The Transcontinental Railroad had been recently completed and was opening up the west. Inventions were rapidly changing life-people must have been shocked at the way things were changing. The first telephone system in a major city was placed in San Francisco in 1878…with 18 lines! 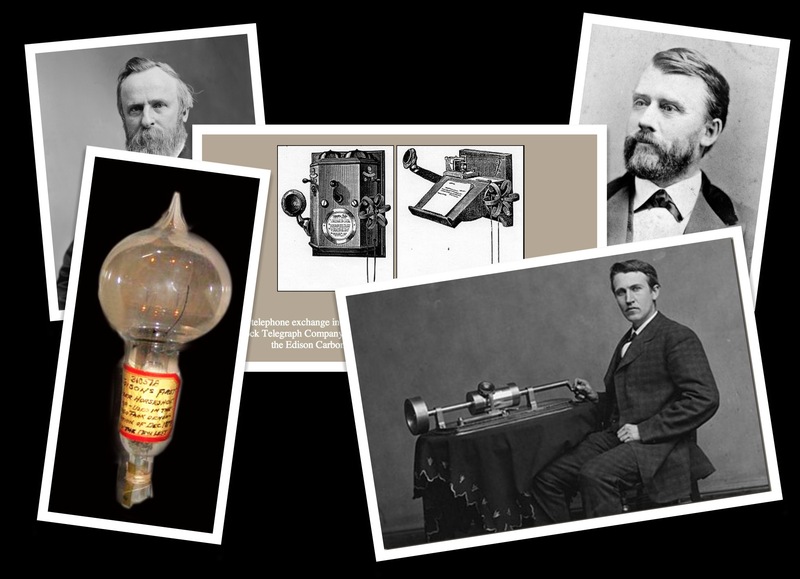 Thomas Edison was one of the inventors of the particular phones San Francisco put in place, and early in 1878 he also earned a patent for the first phonograph… Err, record player….err, the ancestor of the iPod. And just one year later, Edison would demonstrate a working electric lightbulb for the first time. Here in little ol’ Newberg, things were a bit more frontier-like. The town had been given its name almost ten years before our church started, but when we officially incorporated, we followed the older trend that named this area “Chehalem”…we were Chehalem Monthly Meeting. You can see from a map from this time period that the name Newberg isn’t found. There were less than a thousand people here. The river was the main access point, as trees had grown up thick in the 40 years since settlers had pushed out the Native Americans with their practice of regular burning that kept the land cleared. Roads were difficult to make with stumps that didn’t seem to want to ever go away, and land was only slowly being cleared. But in the upper room of the Wood home (I think they used that term intentionally to connect with the disciples waiting in the upper room in Acts chapter 1), on this date in 1878, a couple of dozen people officially read the minute from Iowa Yearly Meeting which established this church. I love the history of our church! I first learned about it and spoke about it in 2003, on our 125th anniversary. I shared about the history again in 2006, so some of you will remember those. But many of you are new since then, and haven’t heard about our beginnings. There are many reasons why I think it’s important to intentionally remember and talk about our history as a church. I’ve always felt a sense of responsibility to the community that has come before us. I didn’t start this church-it had a long and thriving history before I was even born, let alone when I came here as lead pastor in 2002. Remembering our history is a way of staying faithful to the vision of people who sacrificed a lot to give us this community and this building and this way of approaching faith. When I saw that the actual date of the anniversary fell on a Sunday this year, and then combined that with the fact that we are experiencing a sort of major shift in the life of our church with Mauri’s retirement, it seemed like the perfect opportunity to look again at how we started as a church, who we have been and who we are. Looking back can be a challenge to remain faithful to our purpose. As I researched all the changes that were happening in 1878, another thing became clear. Looking back can also be a reminder that the only constant is change. Daily life and church life changes drastically! So as we face the changes that are sure to occur as new people step into leadership for worship, we can take comfort in knowing that we have been part of a community that has weathered drastic changes many, many times…and still remained faithful to Jesus Christ. Today I want to tell the beautiful story of yielding and grace and trust that happened in the very early years of our church. It’s the story of two influential and vastly different men. William Hobson and John Henry Douglas have something to teach us today. First, though, I want to go even further back…much further back to the first century church. Would you turn with me to Hebrews chapter 10? Actually, let’s start in chapter 9; we’ll trace the story rapidly beginning there. If we want to talk about changes, let’s talk about the early church. Christianity began among the Jews. Jesus and all his disciples and the majority of the early leaders were practicing Jews, who worshipped in synagogues and offered sacrifices in the temple. They obeyed the Jewish law, ate kosher food, were circumcised. Then God shook things up by giving Peter a dream, telling him what seemed unthinkable-you can eat anything, even the forbidden foods, if I call it clean. When he woke from the dream, there was the Gentile Cornelius, ready to follow Jesus. Is this ok? Can we let the Gentiles in? Can I eat with them? Associate with them? Do they have to follow the law? These are the battles the church had to face. Everything they knew, their entire way of life and worship, was being turned upside down. The book of Hebrews was a letter written to Jews who knew the Jewish faith and law well. They knew change was coming, and in fact had already occurred. You can see as you skim chapter 9 that the author reminds them of the worship they knew, where the high priest would offer sacrifices once a year to bring forgiveness for all the people. Only once a year could one person enter the presence of God in the Holy of Holies. Year after year, the same thing, the same offering. Hebrews tells them something important in this time of change: not only am I going to tell you it’s ok for the Gentiles to be in. I’m going to remind you that the faith you’ve always loved, the faith that has been good and right for thousands of years…it’s not perfect. In fact, the change Jesus brought is HUGE. Jesus didn’t need goats and other sacrifices-he was the better sacrifice. Jesus didn’t need to offer himself over and over again-his gift was once and for all. Jesus didn’t enter the earthly sanctuary that was just a copy…he entered the real sanctuary in heaven! Jesus is a better priest offering a better sacrifice in real and forever ways…not just in never-ending repeat ceremonies with things that are copies. What great news! But think of how that must have rocked their world in the early church. What massive change in the very way they gathered to worship! What massive change in how they lived each and every day, with the kosher laws being wiped away by the radical, inclusive gift of Jesus! What Jesus did is permanently open the way to God for all of us. Listen to the power of these words: Hebrews 10: 19-25. This passage has a lot to say to us about what worship is. “Let us draw near to God.” I really believe this is the heart of worship. God didn’t stay far away from us, but came near and lived and died and lives again in Jesus Christ. We don’t have to stay away from God in fear. We draw near! We draw near in full assurance of faith, knowing that we are cleaned from guilt and made pure and given a hope that can be held foever. “Let us consider how we may spur one another on toward love and good deeds…” When we gather for worship, it’s not only a little holy individual moment. It’s not just me and God. It is us! And we get to consider, plan, think, be inventive in how we challenge and push each other to live in love and to do the good deeds God has put in front of us. “Not giving up meeting together…” There’s something valuable in gathering to worship. Something important in being with others who are drawing near to God, who are spurring each other on. People have been meeting together to worship Jesus and challenge each other for two thousand years. People have been meeting together in this community known as Newberg Friends for 136 years, and in this exact room for 122! We certainly aren’t giving up now! The very existence of our church, indeed of the entire Yearly Meeting is due to the vision of William Hobson. The history of his life is like the perfect example of the movement of Quakers in the 1800’s. Because of slavery, he left North Carolina where he was born, moving to the North where slaves weren’t kept. 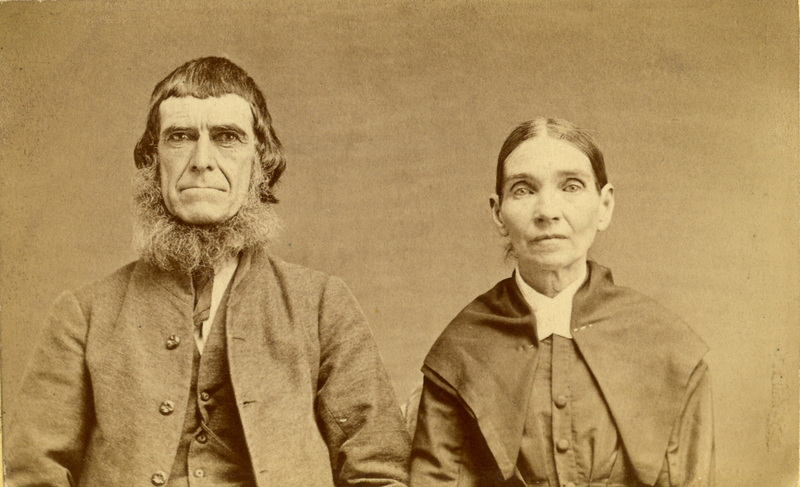 He was a pioneer as a young man in Ohio, again as a middle aged man in Iowa, and to the irritation of his wife Sarah he wanted to be a pioneer as an old man out here in Oregon. He came for the first time in 1870, traveling up and down the West Coast, but didn’t find a place he felt would be “the garden of the Lord” that he wanted to start. Knowing Sarah didn’t want to move again, he tried to be content in Iowa. But in 1875, he had to try again. “This is no imaginary freak of the brain,” he wrote in his journal. “The Lord has laid upon me the arduous work of selecting a suitable location and the commencement of a settlement of Friends in Oregon.” This grubby end of Chehalem Valley was the place he chose, and fortunately, Sarah was willing to join him. Three years later, this church was founded. Everything else, and much more, was to come just as he envisioned it. His work. His vision. His church…only there was something truly beautiful about Hobson in that he didn’t see it as his church. It was God’s work, and he was willing to bend and follow however the Spirit would lead. Hobson was what would best be described as a Conservative Friend. In a time where Friends were being greatly impacted by revivals and preachers, Hobson held to the old ways. The meeting he started here was like our open worship time for the whole service. They gathered in silence, and they spoke only when led by the Spirit. Hobson and some others were recorded ministers, and offered leadership, but it truly was God in charge: a quiet, reflective, calm faith. Completely different worship! Singing, loud, fire, new ways, new energy. This wasn’t what Hobson had started! This wasn’t Conservative Friends worship! It seems at first the older ones didn’t like it so much that they stayed away. But led by Hobson, they apologized for their resistance. They recognized the power of Jesus at work. They celebrated, rather than squashed, this new-fangled way of worshipping the Lord. And people, new people, began coming to the Lord. Dozens, and dozens more at future revivals. You can read the minutes and you can see the records of new people with lives transformed. You can see Hobson exerting leadership…not to make things be his way, the quiet way, the comfortable way…but using his leadership to allow the new work of God, the new way of worship, to continue. 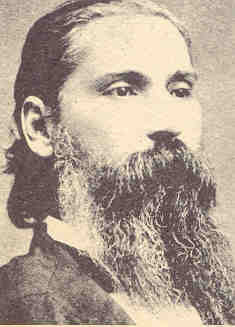 Then came this man, John Henry Douglas. Hobson celebrated how God was changing lives. He was nearing the end of his life; the following winter, he would fall ill, and he passed away in June of 1891. But rather than be bitter at the changes, rather than being jealous that Douglas and other revival leaders brought more people to faith in Jesus than Hobson ever did himself, Hobson was thankful and grateful that God was planting a beautiful garden of the Lord. You can see the uniqueness of our church, of our Yearly Meeting, all coming from the gracious maturity of Hobson and Douglas working together, instead of against each other. The combination of solid Quaker beliefs with an alive, fiery relationship with Jesus…our Yearly Meeting is unique still today for trying to keep these things together. And I think it comes because we began with this great example of acceptance and humility rather than a power grab and fighting for turf and demanding “my way” of worship. May we be people who celebrate what God is doing, however different it looks to my way of thinking. May we honor each other and hold things loosely. And whether we are a quiet Hobson or a fiery Douglas, may we be willing like both to sacrifice as God leads us. Such an inspiration. Them and you. Thanks for telling the story again. Thank you!! Believe it or not, I’ve never heard the story before. And I’ve lived in Portland area since fall of 1952….and grew up in the Friends Church in Homedale. I think that ALL of our churches — especially those of us here in this part of the YM should be made aware of these historical facts. Why not distribute them at Y.M.? He was my 4th Great Uncle, and doing family history I get amazed at my forefathers.